Careerforce engaged Hamish and Vicki from Commercial Fitout NZ Limited to quote and install new office furniture at our new premises. The process, from quotes to installation, was undertaken with professionalism, integrity and flexibility. The fitout process ran seamlessly with the direct oversight of the Commercial Fitout team and the product supplied is high quality and robust. The guidance provided by Hamish and Vicki was based on previous experience and we were pleased to be able to use that to ensure the very best option for our Christchurch based team. We would not hesitate to use Commercial Fitout NZ Limited again should we be moving premises and would recommend them to any potential clients without reservation. The Commercial Fitout team based here in Rolleston helped us with our office and showroom. From the beginning with quoting and design it was clear that the team knew the industry well and have a wealth of knowledge to help their customers. The entire process was simple and easy. Hamish, Debs and Vicki communicated very well during the project and remained flexible as we were experiencing rolling delays with the build meaning they had to juggle our expected date of installation across 4-5 months. They were able to recommend the best products for us, including the best health and safety ergonomic set up for our team. They completed measuring and communicating as each phase of the installation was taking place. 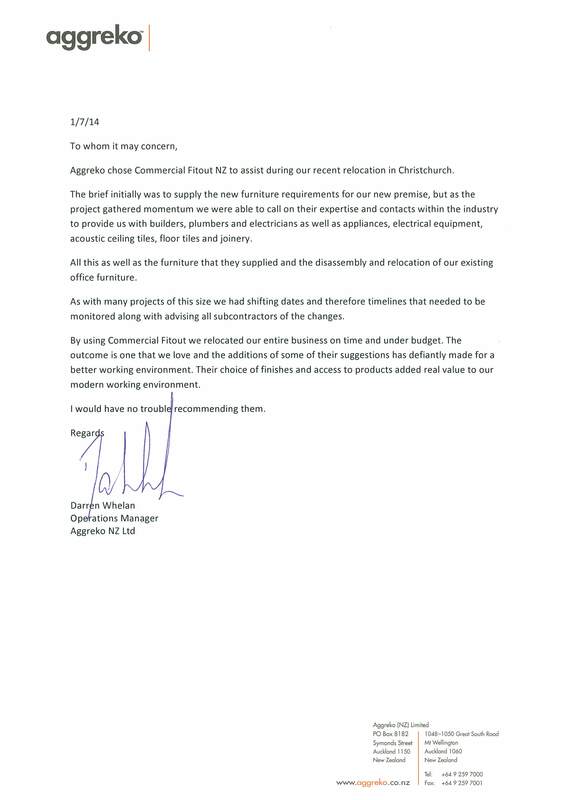 We would highly recommend the team at Commercial Fitout as they provide a professional, helpful and customer oriented service to help with all your fitout needs! Timpany Walton recently engaged Commercial Fitout NZ Ltd to supply all our office furniture requirements for our new building in Timaru. This included a file storage system, office desks, credenzas and various tables and chairs. Hamish from Commercial Fitout was able to provide a wide range of options at very competitive pricing. The furniture was delivered and installed on time. The installers were excellent to work with and we are delighted with the outcome. Hamish communicated well throughout the project, and issues were dealt with promptly and efficiently. 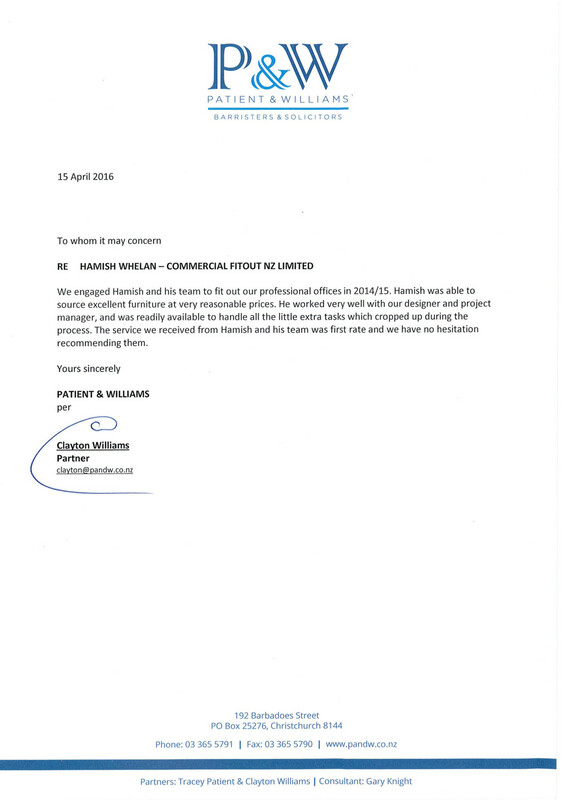 We would definitely work with Commercial Fitout again and are happy to recommend them. Commercial Fitout New Zealand Ltd was engaged in 2013 to supply and install office furniture for a major refurbishment in the Invercargill office. We found Hamish to be very well organised and obliging. He provided a range of options and guided us to preferred equipment given his broad experience in this field. The equipment arrived on time and was installed within the timeframe given. The quality and aesthetic appeal of the office furniture and equipment were as promised and exceeded our expectations. At all times Hamish was available to assist with any queries or issues that arose and was able to resolve promptly and to our full satisfaction. I was first introduced to Hamish in April 2012 as Malloch McClean wrestled with the task of constructing and fitting out a new 1,300 square metre commercial office building in Invercargill. The initial meeting only took place out of courtesy to the person that introduced him to us. At that time, we had already engaged several furniture suppliers whom all offered very similar product specifications. Within a short period of time Malloch McClean recognised that he offered a vastly different value proposition and that we needed to challenge the main stream options that we were being presented with by other providers. As the process commenced, we were not handed a catalogue with pictures, instead Hamish converted our floor plan into a 3D program. This gave all Partners the ability to visually experiment with different styles and sizings of furniture. The sheer volume of choice that Hamish was able to source resulted in a fit out that has enhanced our working environment and differentiated the Malloch McClean Brand. During the process I found Hamish to be honest and challenging towards our ideas and what we thought we wanted. The collaborative style and ability to work with individual staff members’ needs resulted in potential issues being dealt with in the early stages of the project rather than at the end. We had initial reservations about where Hamish sourced its products. During our due diligence phase we visited a large professional office fit out which he had recently completed in Christchurch. We were given positive feedback on the quality of the product and the process Hamish undertook. I now find myself echoing those very sentiments. 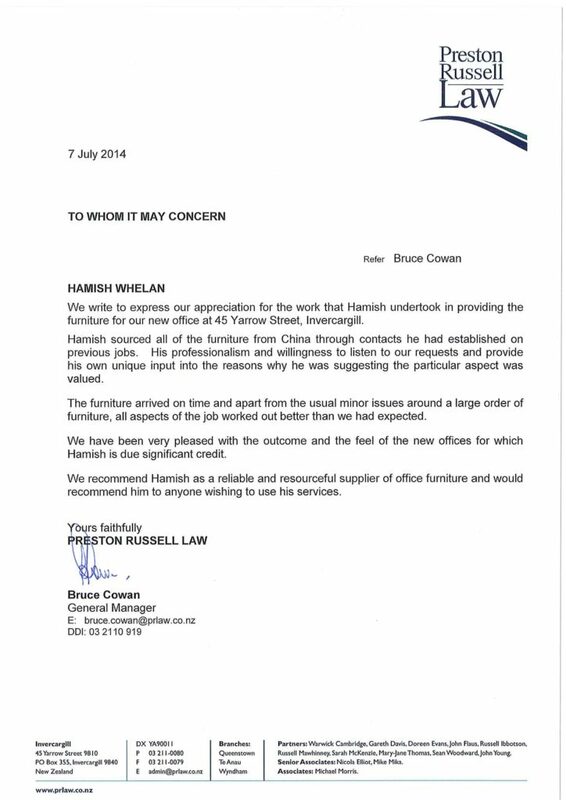 I was also fortunate to visit the factories that Hamish sourced product from in China, which only confirmed what our project team had already been told. The fit out for Malloch McClean was large and included a reception area, 65 workstation open plan area, 9 bespoke Partner offices, 2 small interview rooms, 2 large meeting rooms, a large board room, 2 waiting areas, an IT office, a metal mobile file storage system, locker room and staff café. The sheer volume of what we received and how it was installed was astounding. I still find it hard to believe that it went as smoothly as it did with any of the minor issues resolved quickly and in a timely manner.